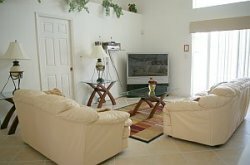 Our Family Fun Villa is located on a quiet residential street in the rural neighborhood of Bridgewater Crossing, a beautiful conservation area with a 40 acre lake, ponds and wetlands. It's so peaceful, it's difficult to believe it's only 12 minutes to the gates of Disney World! Better still, you don't even have to get on the Interstate to drive there - a quiet rural road takes you the entire 8 miles to the gates of the Magic Kingdom, Epcot, the Animal Kingdom and Disney MGM Studios! 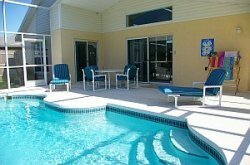 There are many other other attractions - as Sea World, Wet 'n Wild, Islands of Adventure, to name but a few - all within 30 minutes of the villa. If you're a golfer, you'll be in golfer's heaven here! The world class ChampionsGate Golf Resort, a 36 hole resort designed by Greg Norman, is just 2 miles away, as is the prestigious Reunion Golf Resort. Three other renowned courses are within 8 miles of the villa. As you enter the villa via the foyer, there is computer with high speed internet access, which guests may use free of charge. Furthermore, local, national and even international calls (landlines only) to Canada, the UK, Ireland, France, Spain and Italy are free of charge, so you can keep in touch with family and friends without worrying about the phone bill! The open plan living area is beautifully tiled throughout and its high ceilings give it a great sense of light and space. It is separated into a stylish dining area and a comfortable sitting area, where a huge 52 inch projection TV with digital cable and DVD player provides a fabulous viewing experience! 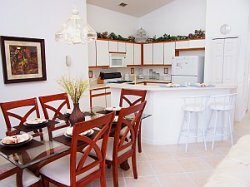 The kitchen is fully equipped (see details below) and there is a breakfast bar for more casual dining. A separate laundry room houses a washing machine, clothes dryer, iron and ironing board. The spacious Master bedroom has digital cable TV, a large walk-in closet and an en-suite bathroom with shower and large corner bath. The Queen bedroom is also en-suite. The third twin bedroom and the fourth children's bedroom share the third bathroom, which has a bath/shower combination. Kids will love their Disney themed bedroom with its colourful bunk beds and furniture, not to mention the TV with digital cable and Play Station! 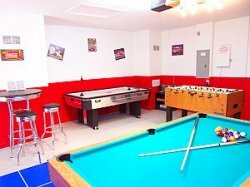 Kids of all age will want to spend time in our fabulous 50s diner style games room - its cool decor and choice of games (billiards, air hockey, table tennis, foosball tables and darts board) makes it a great place to hang out! The screened pool has underwater lighting and heating for the few cooler months of the year. The shaded lanai with table, chairs and sun loungers is a big bonus, as it means you can enjoy relaxing outside whilst staying in the shade (the sun does get very hot here!) It's the ideal place to enjoy the delicious BBQ you've prepared on the gas powered grill on the patio area in the yard.